When it comes to makeup, I'm always on the hunt for high quality products with a low price point. Albeit it's been challenging at times, I've discovered five budget beauty buys which perform like high end products, all for under £10. After years of being an avid beauty lover and blog reader, its become apparent to me that finding a great quality base product for an equally as great price isn't so common. I always see my favourite makeup artists using products such as the Giorgio Armani Luminous Silk Foundation, but what I don't see much of is the use of drugstore bases. This is why I'm absolutely chuffed to have discovered the L'oreal Infallible 24H foundation; this foundation is a mere £10 and performs as brilliantly as my Charlotte Tilbury Magic Foundation, the shade range is pretty great for the paler girl too! If I'm looking for something that will give my skin a flawless finish, whilst still looking like skin, I'll always gravitate towards this. When used in conjunction with the Collection Lasting Perfection Concealer, my skin can seriously go from 0-100 so fast. The collection concealer is £4 and seriously packs a punch in the coverage department, say goodbye to those dark under eyes and say hello to an awake looking face! I've also fallen head over heels in love with the Natural Collection Blushes; I own every single shade and for £1.99 you really can't go wrong. The pigmentation really is incredible, and they're surprisingly long wearing too. The only thing I wish is that there was more variety in the shade range - I'd love a coral tone! When I'm on the hunt for a new mascara, which admittedly isn't too often as I definitely keep mine for way too long, I always go to my local boots and head straight to the Maybelline stand. I just know that whatever tube I decide to go for, it will not fail me or my lashes. Recently, I discovered the Lash Sensational Mascara and bloody hell, my lashes have never looked so good! The formula combined with the brush on this mascara do the best job at lengthening the lashes as well as injecting volume into the base of the lash too, I've even found myself ignoring my false lashes and reaching for this when creating makeup looks (which never happens). Last but definitely not least is probably my favourite drugstore product of all; the Collection Colour Lash Mascara. I actually use this as a brow gel and it's absolutely fantastic, my brow hairs stay tamed and in place all day. This is actually comparable to my Anastasia Beverly Hills brow gel and is only a fraction of the price - amazing, right? 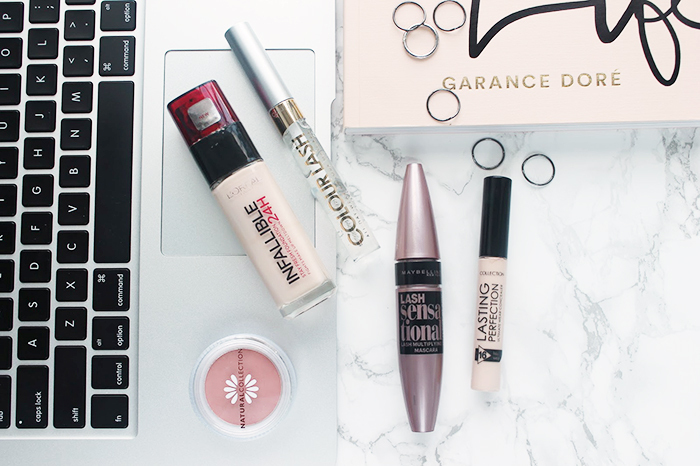 So there you have it, my five best budget buys for any beauty lover! What're your must have budget beauty products? Great post! The l'oreal foundation is amazing! I had never heard about those blushes before but they sound amazing!